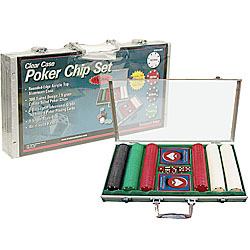 Includes a designer round-edge acrylic top aluminum case that holds 300 poker chips, 2 decks of playing cards, and 5 dice. The clear top goes all the way to the edge on two sides, allowing greater visibility of the case’s contents. All poker chips are casino style 7.5 gram suited design. Total weight approximately 6.8 US pounds. A good inexpensive chip set! Looking for Doyle Brunson’s Super System? Click here! Looking for Mike Caro poker books? Click here!